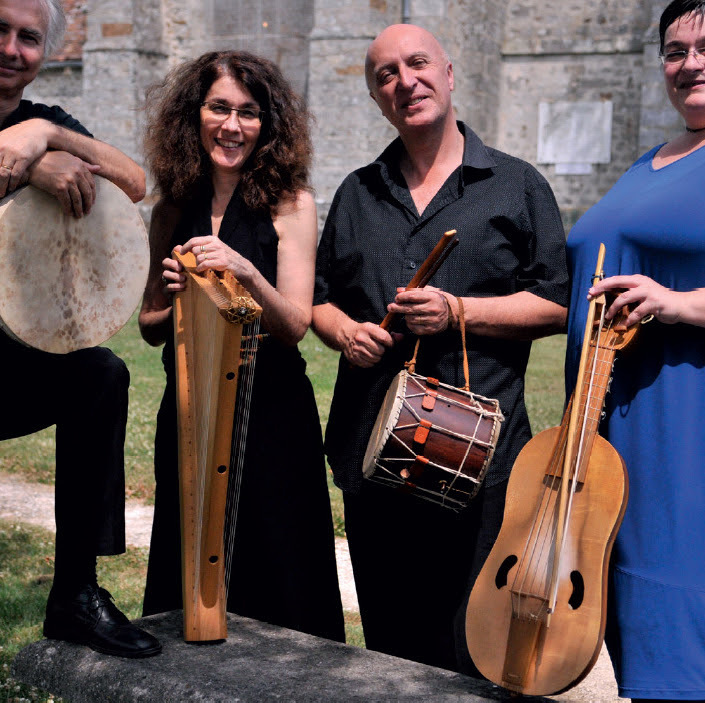 The great French medieval ensemble (affiliated with the center for Medieval Music inParis) celibrates the relationship of Jews and the trouvères culture. This program is dedicated to the religious and festival songs of the Jewish communities living in northern France (Flanders, Picardy, Artois, Champagne, and elsewhere) in the second half of the 13th century. During this troubled period, a time spanning the burning of the Talmud (1242-1244) to the great expulsion of 1306, Jews shared much of their daily life and language with Christians. They also shared a common taste in literature, in monuments, in the sounds of cities and fairs, in their joie-de-vivre and in popular music. The Jewish communities sang songs about daily life as well as on solemn occasions, both happy and sad. These songs reflect their deep attachment to ritual and tradition and also their strong connection to their environment and its language, langue d’oïl. Only the recitation of liturgical poems, prayer, and study were still performed in Hebrew. In the surviving books and manuscripts, every poem, whether in French or Hebrew, is written using the Hebrew alphabet (the only one Jewish students were taught). We know the authors of many of these poems, but none of those who adapted them to langue d’oïl. Thanks to research by eminent scholars like David Simon Blondheim and Raphael Loewe, we know that these poems were put to melodies taken from the repertory of the trouvères. Hebrew poetry has for many centuries used the practice of contrafactum to adapt texts widely known to popular melodies. Jewish musicians did not know neumatic musical notation (with the exception of Obadiah the Proselyte), but sometimes a scribe would write the title of the song from which the melody came directly on the manuscript. Among the manuscripts, only two indicate clearly the melody to which the text was sung. For the others, the music had to be (re)created. The substantial task of researching and comparing the sources and transcriptions both of the texts and the music was undertaken by Colette Sirat, Judith Olszowy-Schlanger, and Brigitte Lesne. Their efforts were essential to recreating, once again by contrafactum, these Hebrew and langue d’oïl songs. The final result is astounding. From the pages of centuries-old manuscripts rises the boisterous and sensual music of a colorful world inhabited by Jewish people who proclaimed their faith, pain and joy. This world vanished following the final expulsion of the Jews from France in 1394, and we are proud to give it life once more in this program. Of all the songs on this afternoon's program, only two came with so much as an incipit which could be used to identify the trouvère song that should be used with the text supplied. It was therefore quite thrilling to reconstruct this corpus of song texts found by the paleographic scholar Colette Sirat in Hebrew manuscripts copied during the 13th century in the north of France: the absence of musical notation in the manuscripts made it quite a challenge. Only two of the songs had incipits indicating what melody should be used. There is one reference to the Vadurie, a song by Moniot de Paris, and to Tuit cil qui sont enamoraz, an anonymous refrain. The presence of these two incipits attests to the practice of contrafactum (meaning "sung to the tune of") during the Middle Ages. We felt ourselves therefore justified in approaching the remaining songs in similar fashion. To find melodies that fit the texts, we examined the repertory of the trouvères, and looked for melodies that contemporary Jewish musicians would have known. Interestingly, all of the poems were copied in Hebrew characters. Some are phonetic transcriptions of langue d'oïl, the language then spoken in northern France (this gives rise to uncertainty as to original spellings). Others alternate between Hebrew and langue d'oïl, illustrating the thorough integration of these communities that naturally used the vernacular to communicate. As early as 850 BCE, Jewish communities, the Diaspora, were present outside of Palestine—first in Syria, then Babylon, Egypt, Greece and Rome. Jewish communities were founded in France starting in the 1st century, particularly along the Mediterranean coast and in the large river valleys of the Rhône, the Saône and the Rhine. From that time onward, Jewish communities continuously inhabited the south of France. During the 10th century, Jewish communities were founded in the north of France. The first were in the Champagne region and coalesced around rabbis whose spirituality was equaled only by their deep understanding of the Hebrew Bible and of the oral traditions recorded in the Talmud. The city of Troyes distinguished itself early on through the genius of Rachi (Rabbi Shlomo Yitzchaki, 1040-1105), whose comprehensive Biblical and Talmudic commentaries remain at the center of Jewish religious study to this day. Numerous Talmud schools were founded during this period and an educated class flourished. The Jews living in the north of France—regions located north of the Loire river—felt they belonged to a single common culture: Tsarfat. In the 12th century, representatives from the communities of Troyes, Dijon, Auxerre, Sens, Orléans, Chalon-sur-Saône, Paris, Melun, Normandy, Anjou, Poitou, the Rhineland, and Lorraine gathered to find a solution to a legal issue affecting communities and their members. Though each community was generally small—usually no more than thirty families, or about 150 people—there were a staggering number of them. There were about 150 in the Ile-de-France and Champagne regions and 50 in the Bourgogne region. Taxes were levied on the community as a whole and it was up to the leaders of each community to decide how best to divide up the burden among each family. Each community elected a rabbi and a cantor and appointed a kosher butcher and baker. In principle, each had a hospital, a cemetery and charitable institutions. The Jewish houses would be located around the synagogue, which hosted not only religious services but schools for children and adults as well. Interfaith relations were friendly at first, but they deteriorated as the crusades gained popularity (1096). Over time, Jews were barred from an increasing number of professions and activities in agriculture (because of restrictions on Jewish ownership of land) and crafts (because Christian guilds would not accept them). Meanwhile, the Church forbade Christians to lend money with interest, but it allowed Jews to do so as long as the interest rate was not too high (or else it was considered usury). However, mortgage loans were controlled by monasteries, and commercial loans were in the hands of the Lombards; thus, only short-term money loans remained open to Jewish lenders. But this was a precarious endeavor: high taxes levied by the prince meant that interest rates were high. This led borrowers, who often had nowhere else to turn to for a loan, to turn their anger on the lender. The crusades nourished hatred for the Jewish people and encouraged pogroms and expulsions. The first accusation of ritual murder was recorded in the town of Blois in 1171; thirty-one men, women and children were burned at the stake, and against all reason, rumors that Jews were committing ritual crimes continued to spread. These accusations led to persecution and massacres, such as the one in Troyes in 1288. In 1240, a public disputation was organized by Louis IX (Saint Louis) to accuse Jews of having abandoned the Bible in favor of the Talmud, and it resulted in the burning of 1,200 Hebrew books. The Jewish communities also had to contend with revolts such as the revolt of the Pastoureaux (the Shepherds’ Crusade). In 1331 the persecution of lepers spread to the Jews as well. In 1348 during the Black Death, Jews and lepers were accused of poisoning wells. Philippe Auguste was the first to expel Jews from the kingdom of France in 1182 before allowing them to return in 1198. This cycle was repeated in 1306 when Jews were expelled from all of northern France before being allowed to return to certain areas. The final expulsion occurred in 1394 and marked the end of fourteen centuries of Jewish life in France. The exiled communities sought refuge in the Dauphiné, in Provence, and in the Papal States of the south of France.